Before fireworks and an after party brought the curtains down on the 45th BVI Spring Regatta in Nanny Cay on Sunday night, sailors from 20 countries engaged in three days of competitive racing in the Sir Francis Drakes Channel. The competition wrapped up with some furious finishes and podium changes coming down to the last race in some divisions. Spookie won every race in CSA Class I, ending the leader board with 7 points. Puerto Rico’s Luis Jurabe on Soca finished with 18 points while Italy’s Christian Zugel’s Tschuss, a Matt 1180, overcame a three points deficit with a second and third place finish in the final two races, to knock Tom Elsen of the USA’s Big Trouble into fourth place. They finished with 23 points to Elsen’s 25. 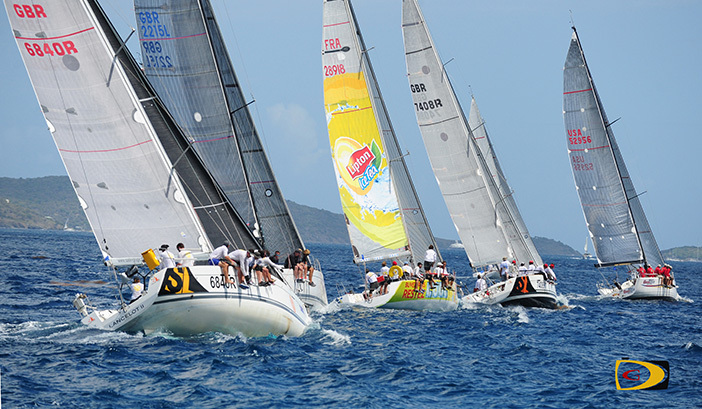 The most competitive racing was in the One design class off Nanny Cay, featuring the IC-24s and VX One. After missing the first race because the duke tracks were lifting up and had to be fixed, USVI’s Jens Hookanson on Stinger—who finished the first day in second behind the BVI’s Colin Rathbun on Aeropost—dropped three bullets on the board on Saturday morning to seize the lead as Rathbun countered with a 4-5-5 tally. Hookanson went into Sunday with a five edge over the BVI’s Alec Anderson, who used consistency to move ahead of the USVI’s Gregory Fink on Kuliagus to lead by a point, 26-27 setting up a Sunday showdown. In the end, St. Croix’s Hookanson’s dominance was such that the only had two second place finishes and nine bullets for his 24 points. Anderson had 34 and Fink, 39. In the inaugural VX One Class at the BVI Spring Regatta, the USA’s Jeff Eiber sailed This Side Down to a to victory by being consistent as he overhauled early leader, USVI’s Timothy Pitts’ Cruzan Rhode, who placed third behind George Gamble’s My Sharona. Keith LiGreci—who also won Best BVI Boat—had all picket fences on Girasoli in Jib and Main 2, in winning the class with five points ahead of Great Britain’s Peter Hopps and Serana Alexander’s Sam of Hamble. BVI’s Dr. Robin Tattersall—soon to be 86 and sailing on his 86-year old classic Diva a modified 30 square meter—finished third. St. John’s Nils Erickson Formula 40 Soma, was the class act in the Multihull I, putting up all bullets and gave BVI’s Triple Jack a Kelsal 47, no chance for home bragging right after starting off with a third place finish and ended the competition in second on 11 points. Glen Davis’ Outremer 51, Ten Directions was third. Puerto Rico’s Dark Star a J105 owned by Johnathen Lipusecek, secure the top spot in Racing 3 with 8.5 points, ahead of the BVI’s Chris Haycraft’s Sirena 38, Pipe Dream with 15.5. St. Maarten’s Frits Bus’ Meleges 32, Island Water World finished third had 30. Brazil’s Renato Cunha Faria in its debut, with Ventaneiro 3, won the Performance Cruiser 1 Class with six victories. Sjoerd Bos’s Swan 51, Northern Child was two points better than the BVI’s Pat Nolan’s Sea Biscuit, a Moorings 445.